It’s true. You can’t learn about acting through reading a book. You should get out there and act. But there are some great books on acting that can help both the aspiring and the seasoned actor and I would like to share some of my favourite ones. This is a great book, particularly for those starting out in the industry. Any actor will tell you that the industry can be tough but this book can really help you assess who you are, why you’re doing what you’re doing and how to ensure your career flourishes. It’s one of the essential books on acting for any aspiring actor. OK, so this isn’t strictly a book about acting but it is an essential book for anyone interested in the arts and creativity. It might even inspire your next screenplay! Many of the best actors have trained in the Meisner technique. I was interested in this way of working and developing character so I found a drama school that taught his method. It’s just one acting method and there are many others. I believe this is one of the best books on acting from one of the great masters. I love Marlon Brando and I think he was a great actor. Honest and visceral in his performances, I’m always mesmerised when I watch him. Here he shares his thoughts on acting, his craft and the world. Admittedly, he became a little jaded in his later years but it’s still an interesting read. This is one of the first books I bought on acting and it’s dog-eared and note -ridden. I often dip into this book when I need some quick reminders and Moss is a wonderful acting coach. Here he shares some great tips which have helped some of the great Academy award winners such as Hilary Swank and Helen Hunt. This is not just a book for actors. Directors, critics and writers will benefit from it too. If you want to learn about how to develop the essential techniques such as character development, calling up emotion and strengthening awareness then this book is for you. I believe it is the essential handbook for actors. 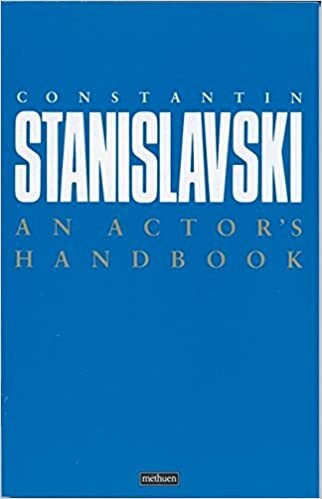 Stanislavski was a brilliant Russian theatre practitioner. He created the world-known ‘system’ and if you want to learn more about the craft then this book is you for. It’s alphabetically arranged which makes it more accessible and is useful for actors, writers and directors. There are many other great books on acting and I’ve just scratched the surface here. Do you have any good acting book recommendations you would like to share?